The tilapia I’m most familiar with are whole fishes, fried or grilled. Either way, it’s almost always delicious. So despite not having experience cooking filleted tilapia, I decided to give it a go and grabbed some packs of the frozen fishies. What I did was dust the tilapia fillets with Cajun seasoning, then pangrill lightly. As expected, it turned out really good as the lightly flavored, flaky tilapia flesh had a light, fresh sweetness that was perfect with the spicy seasoning. Together with the tilapia, I lightly sautéed some celery and carrots in butter and more Cajun seasoning. Yes, the salty-spicy stuff, I love it quite lots. On the side, I had a healthy helping of creamy potato salad, made the way my friend Turtle makes it, with lots of minced veggies and the potatoes partially mashed. NOM! Lastly, yes. That is a duck. No, said duck is not edible. It’s actually a food pick. Well, either that or a cake trimming but either way, it’s food-safe and it’s cute. Say hi to Mr. Ducky everyone! 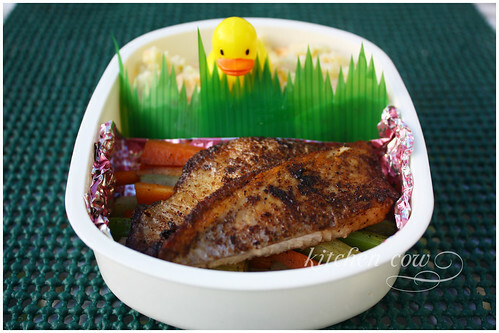 At least something cute finally escaped from being eaten in my bento. Loving bento boxes at the moment! I didnt even know what they were until a couple of weeks ago when a new Asian place opened near me and totally hooked now! Shame the duck isnt edible though, that would have made it awesome! The duck looks so endearing. Thanks everyone— BUT waaaah! Don’t eat the duckie!